At the semester meeting in the Swedish artistic research school at Gotland we did an improvisation with the wonderful Méliès film "A trip to the moon". The entire concept of playing music to film is something I am interested in exploring further. After several projects, notably Diagonalsymfonin and the project with Isaac Julien and most recently, the work I've done with Anders Elberling, I would like to take it a step further. Méliès is sometimes referred to as the first "Cinemagician". 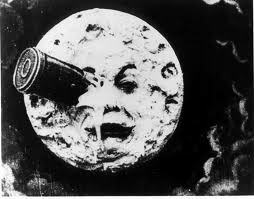 Two of his best-known films are A Trip to the Moon (1902) and The Impossible Voyage (1904). Both stories involve strange, surreal voyages, somewhat in the style of Jules Verne, and are considered among the most important early science fiction films, though their approach is closer to fantasy. Méliès was also an early pioneer of horror cinema, which can be traced back to his Le Manoir du diable (1896).